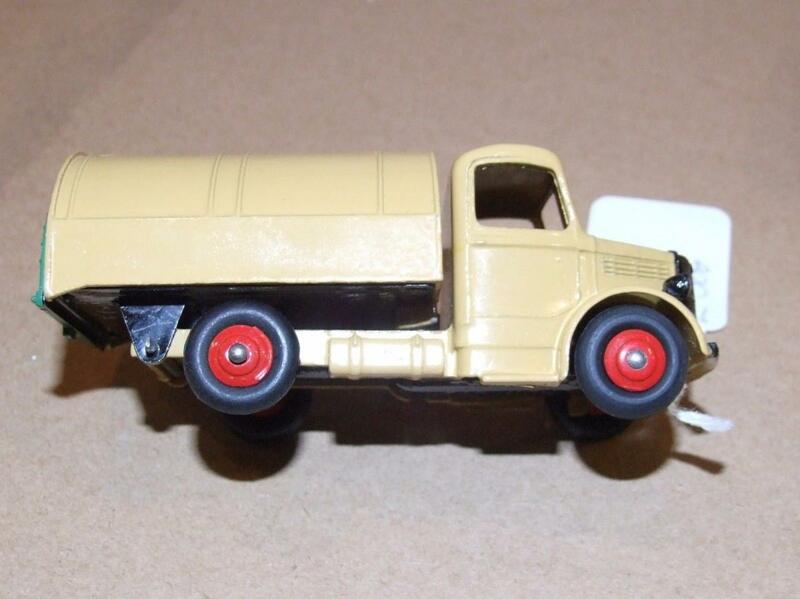 What better way to start a topic on the original Bedford Refuse Wagon but with a dual numbered 25v-252 box that was perhaps the rarest box for this model, a plain yellow end flap box. The dual numbering is rather strange as the box itself was issued between March 1959 and July 1960, four years after dual numbering had ceased. 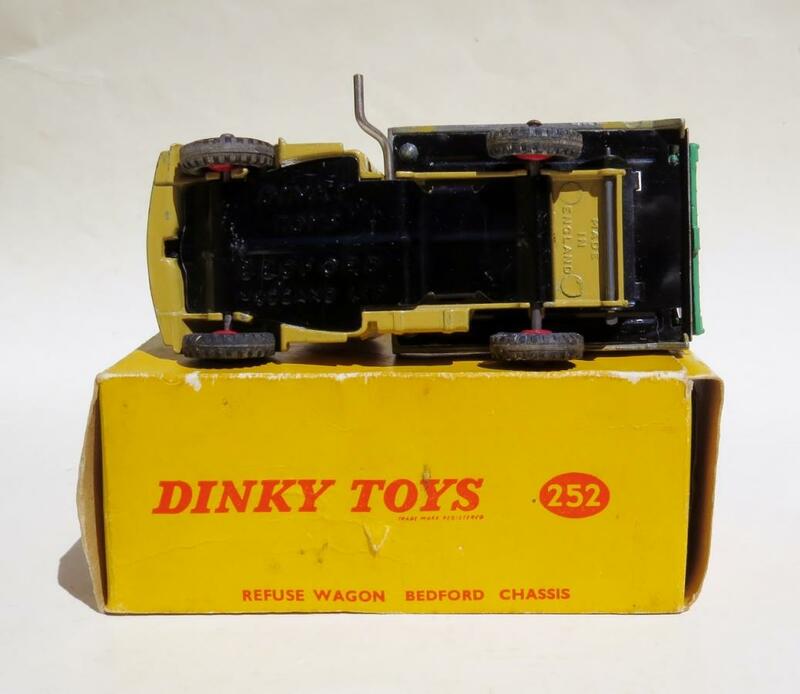 It was also the only box issued for the 252 Refuse Wagon that included the manufacturer's name of "Bedford". 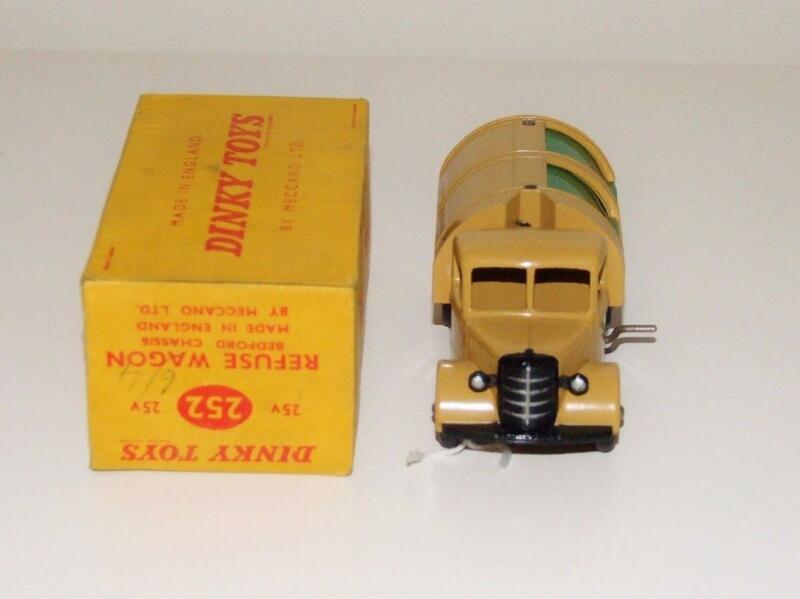 The pictures below of the model that was packaged in this plain yellow end-flap box was in the last issues before the model was given the luxury of window glazing at sometime during the latter half of 1960. During this time frame, new colours of lime green and orange were also introduced packaged in the plain yellow end-flap box firstly without window glazing. 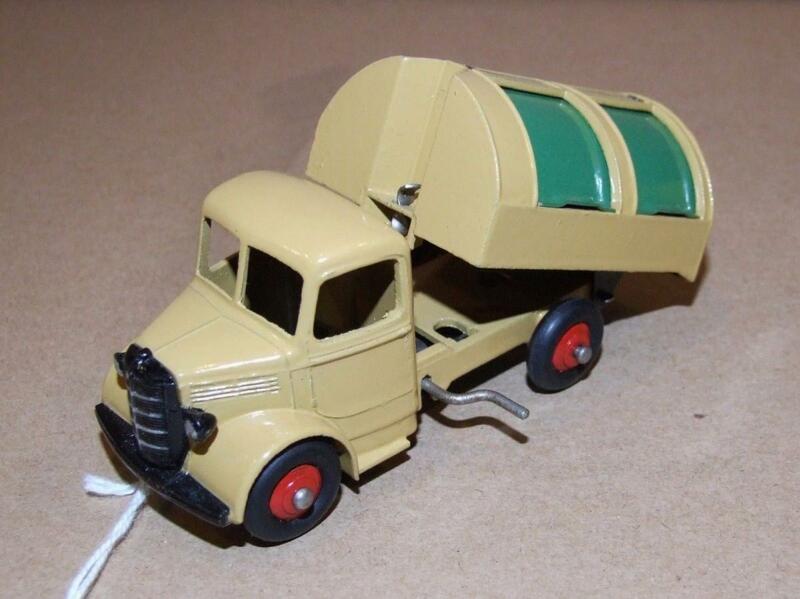 The Refuse Wagon started life in October 1948 as sales number 25v. In 1954 the model was renumbered 252 and made its last appearance in the January 1964 catalogue issued for the United Kingdom. With the model not listed in the Australian catalogue printed in May 1964 it can be assumed that production was terminated sometime between those two dates. Its replacement, the 978 Bedford TK Refuse Wagon arrived in October 1964 which was a very modern looking vehicle as the old 252 Bedford had become very antiquated. Of course at a price of 14/11 it was 7/- more expensive than the model it replaced and more than three times its size too. So by 1964, Meccano was manufacturing models that were expensive to make and expensive to sell, so the seeds were being sown when the old economics had long been forgotten. 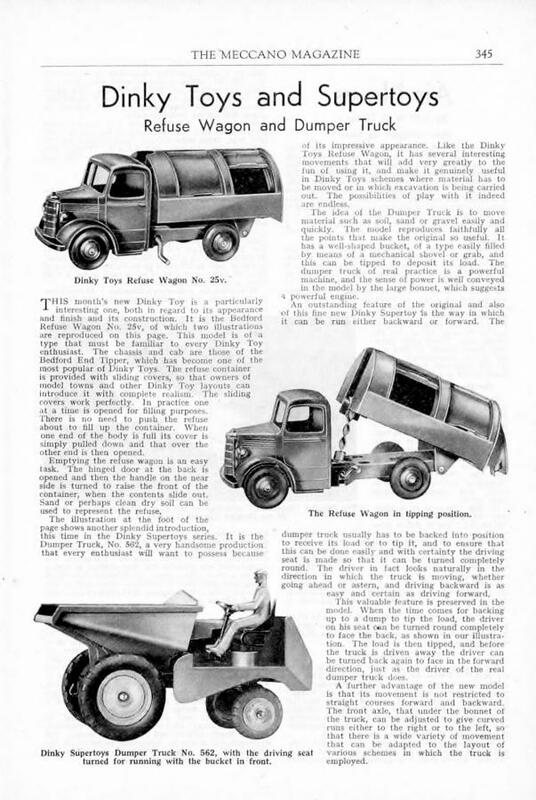 The October 1948 issue of the Meccano Magazine announced the arrival of the 25v Refuse Wagon that included an advertisement as well as an article on Page 345. 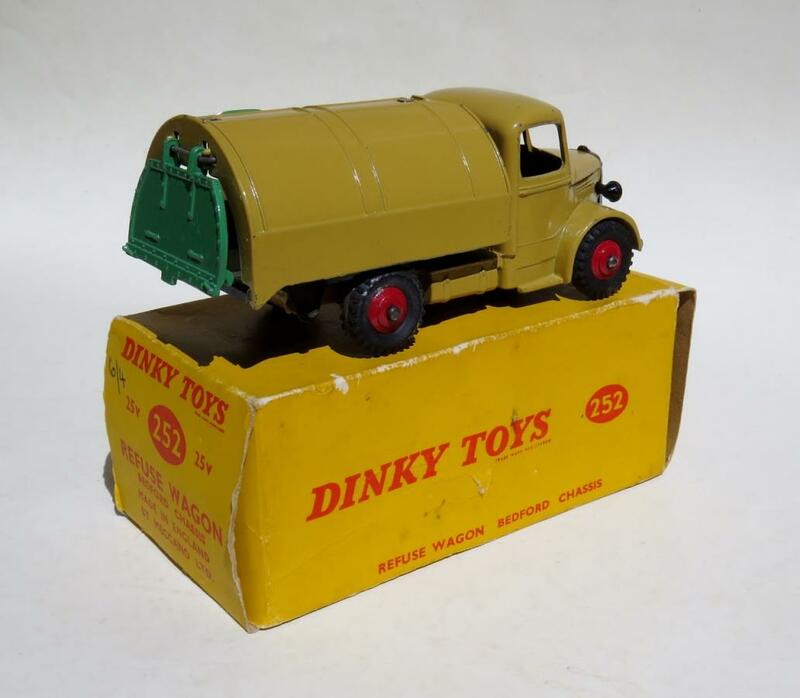 The other model that was included in the article was the Dinky Supertoys 562 Dumper Truck that had been launched the previous month in September. The Dumper Truck was not at this stage referred to as a Muir-Hill. Copies of these are below. In 1954 the model was renumbered 252 and made its last appearance in the January 1964 catalogue issued for the United Kingdom. With the model not listed in the Australian catalogue printed in May 1964 it can be assumed that production was terminated sometime between those two dates. Its replacement, the 978 Bedford TK Refuse Wagon arrived in October 1964 which was a very modern looking vehicle as the old 252 Bedford had become very antiquated. I stand corrected with the last appearance of the 252 in any catalogue or price list. 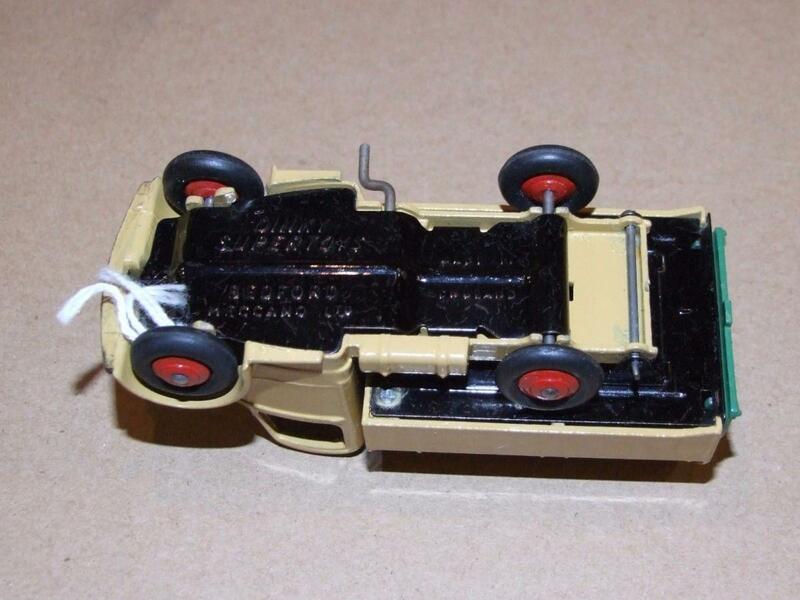 I have just located a 1964 MECCANO TOYS OF QUALITY price list with the print details of 16/964/60, (September 1964), so the little Bedford Refuse Wagon soldiered on until the new Bedford TK arrived on the scene the following month. 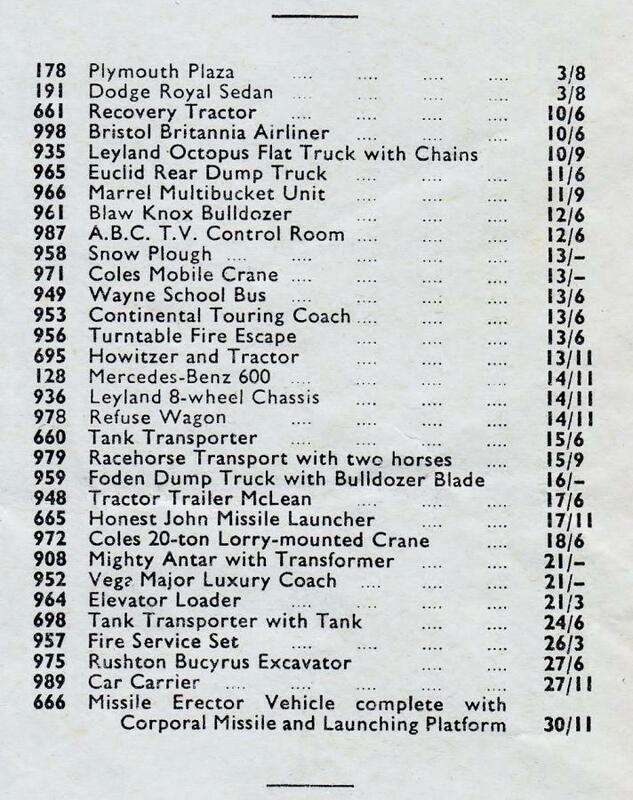 In fact, this price list also included the new 978 Bedford Refuse Wagon which was to be released the following month! So it is quite possible that both models were on sale simultaneously in many stores both in the UK and abroad. 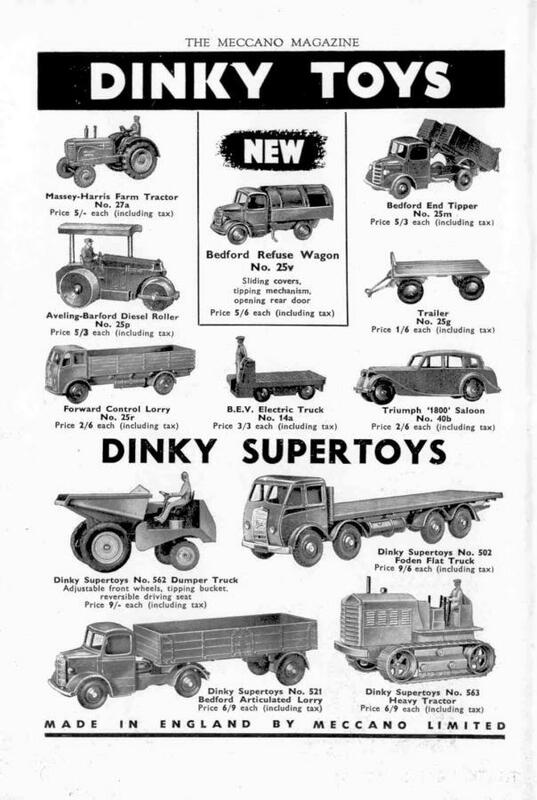 A copy of page 4 from the 1964 price list with the available Dinky Toys is below together with the 978 Bedford TK Refuse Wagon's first appearance although it was only known then as 978 Refuse Wagon without a later reference to its tipping action. Your dual numbered 25v/252 box is exceptional indeed, Bruce. As I showed in one of the factory lists the old numbers seem to have been anything but 'dead' in the factory practice around 1960, which may explain somehow why this odd anachronism could happen. Something strange is going on with the dual numbered box 252-25v with Bedford Refuse Wagon from Bruce Hoy above under comment # 1, compared to the same dual numbered box with Bedford Refuse Wagon for sale on Ebay UK by vintagediecast-uk with item number: 202107491181 for the price of GBP 295. 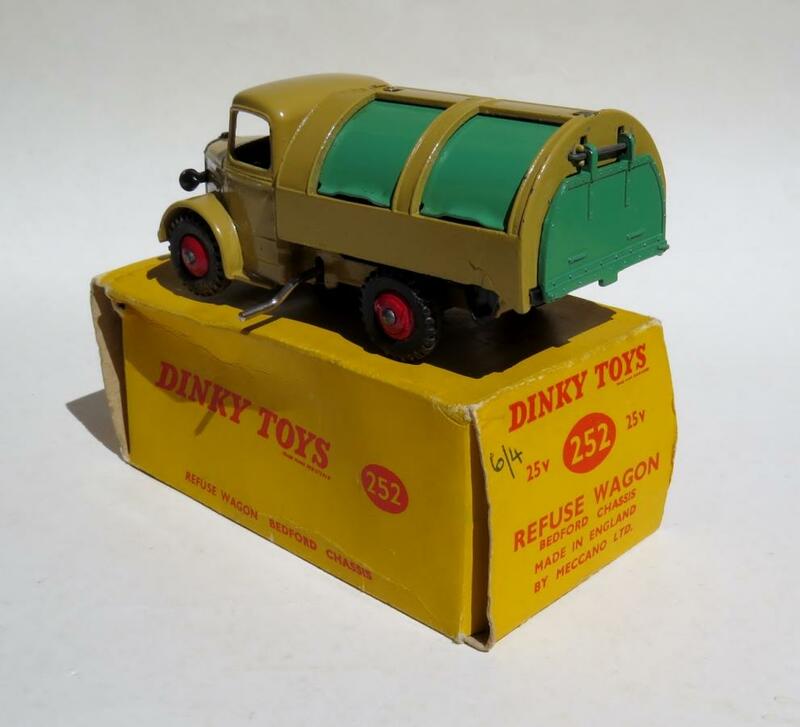 See link: https://www.ebay.co.uk/itm/Dinky-Toys-252-Bedford-Refuse-Lorry-Dark-Gree... .
On both boxes is a pencil price of 6/4. That proves that the boxes were priced in 1959. 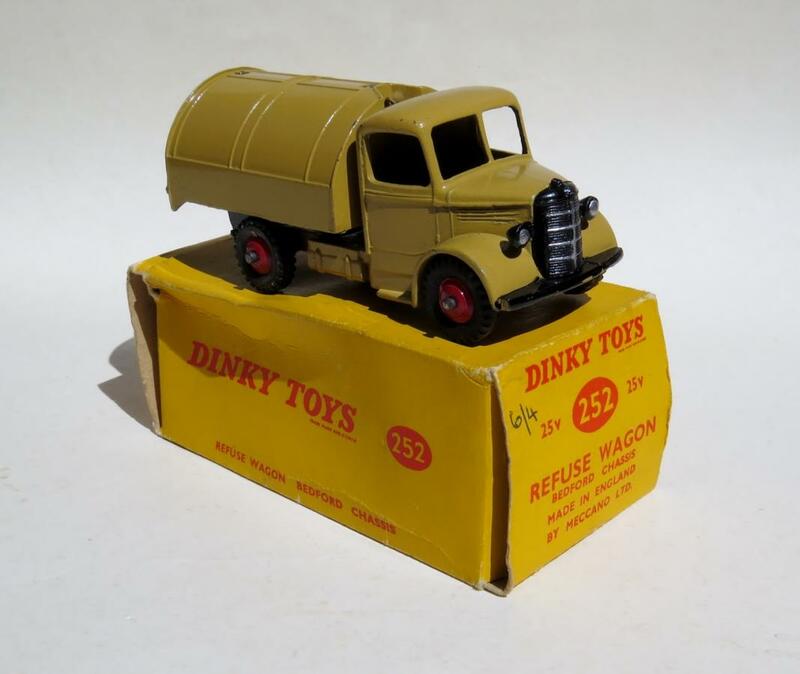 In the Dinky Toys catalogue UK 1959 is the 252 Bedford Refuse Wagon priced for 6/4. See my added picture. For a good understanding were the price of the 25v-252 from 1948 till 1959 as folow: 1948 4/9; 1949 4/9; 1950 5/9; 1951 6/2; 1952 5/11; 1953 5/6; 1954 5/10; 1955 5/3; 1956 5/11; 1957 6/3; 1958 6/6; 1959 6/4. Both boxes are exactly the same, but there are differences in the appearance of the 2 Bedfords if you compare the models and the 2 baseplates with each other. Bruce's looks like the total appearance to date at 1959. It has the correct baseplate, it has the diecast strengthening on top of fuel tank which the Ebay's one is missing and the engraved pattern black tyres by Bruce were fitted in 1959, while the Ebay's one has smooth black tyres. The Ebay Uk one's baseplate looks like 1954 at the latest, because "Made in England" is stamped on the black tinplate instead of on the cast of the rear part of the bottom as usual after 1954, as which is correct done on Bruce's one. The smooth black tires of the Ebay UK one belongs to an early Bedford Refuse Wagon with this base plate until 1954. I think the Ebay dual numbered box does not belong to this Bedford Refuse Wagon. It seems to me unlikely that a Bedford Refuse Wagon of at the latest 1954 will be issued with a box from 1959. In itself it is already a mystery that this peculiar plain dual numbered box 252-25v was only published in 1959, while the renumbering took place in 1954. But these 2 identical plain dual numbered boxes with the same price 6/4 on it prove that it must have been an original issue in 1959. I think the issue of the plain dual numbered box has to do with saving on print costs and that an erroneous assignment has been given to the maker of the boxes by mistake. Comments about this are very welcome. A mystery indeed! This example may have come from a trade box containing four mint early models. As soon as separated from that the (new) owner may immediately have looked out for - and found - an authentic individual replacement box, albeit not a contemporary one - and incidentally even an unusual and rare one. I received the real counterpart of the dual numbered box 252-25v of Bruce, presented by him in comment #1 of this topic and discussed above. This model and box was made in the transition period of renumbering in 1954 and has a dual numbered yellow picture box 25v-252. I received this model and box out of the USA and on the box is a pencil price of $ 1.75. It is a nice addition to the contributions above. 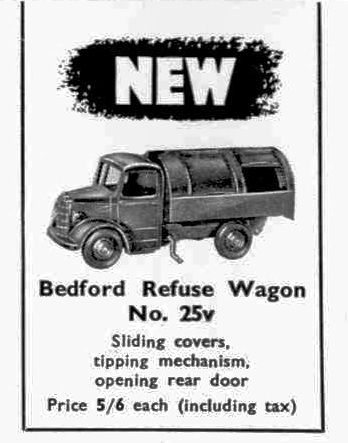 My received Bedford Refuse Wagon with his dual numbered box 252-25v and USA price $ 1,75 on box. Transition period renumbering 1954. Now I have 3 different period versions of the Bedford Refuse Wagon: 1) an early one (1948); 2) a middle (transition) one (1954) and 3) a late one (ca 1961). I am very happy with this pencil price of $ 1,75 on the box, because I can compare that price with the prices in my USA catalogues and determine the time of sale. In the price list of DT USA catalogue 1954 the price for the 25v indeed was $ 1.75, so it confirms the date of sale in 1954. The price development of model 25v from 1950 till 1962 however was very remarkable: 1950 - $ 1.75; 1951 - $ 1.85; 1952 - $ 2.00; 1953 - $ 2.00; 1954 - $ 1.75. After 3 years of price increase, the price was again reduced to $ 1.75 in 1954, the same price as in 1950. From 1954 till 1961, the price for the 252 Refuse Wagon remained at $ 1.75 to rise at last in 1962 to $ 2.35. 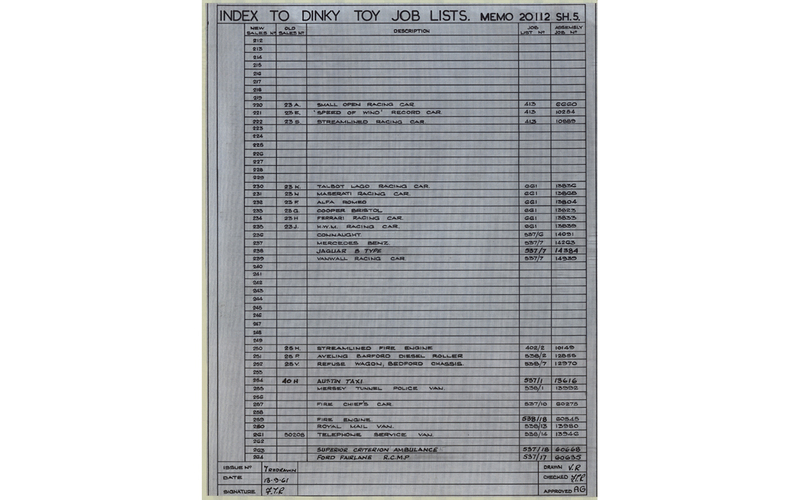 From 1950 till 1954 USA DT catalogues had only separate price lists within it which often are missing. I show these loose price lists for them who are interested in it. Otherwise you can scroll down. Below I show my 3 versions of the Bedford Refuse Wagon. Separate Price list in DT USA 1950 catalogue with 25v Refuse Wagon for $ 1,75. 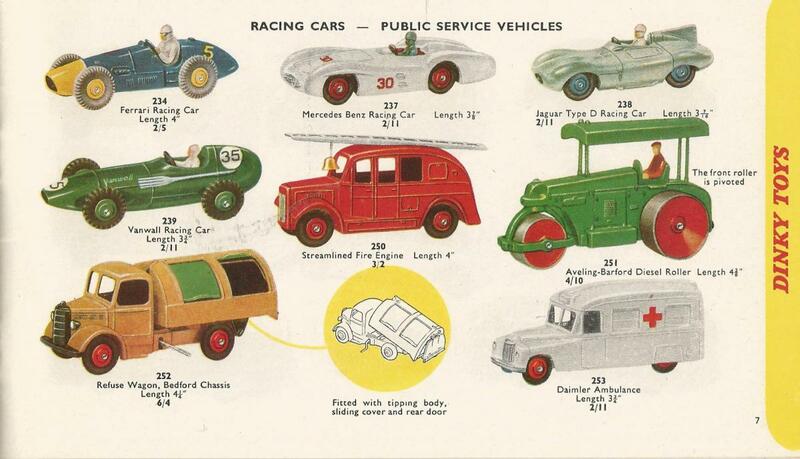 Separate Price list in DT USA 1951 catalogue with 25v Refuse Wagon for $ 1,85. Separate Price list in DT USA 1952 catalogue with 25v Refuse Wagon for $ 2,00. Separate Price list in DT USA 1953-1 catalogue with 25v Refuse Wagon for $ 2,00. Separate Price list in DT USA 1953-2 and 1953-3 catalogue with 25v Refuse Wagon for $ 2,00. Separate Price list in DT USA 1954 catalogue with 25v-252 Refuse Wagon reduced to $ 1,75, the same price as on my dual numbered box. DT catalogue USA 1955 with on the left page British 252 Refuse Wagon for $ 1,75 and on the right page his French counterpart F25v Sanitation Truck for $ 2,25. 1948 1st version - Baseplate with small lettering. Domed type wheels. Smooth black tyres. Note the front and rear axle support. 2) My 2nd version 25v-252 - 1954: Rounded corners on front mudguards. No windows. Large air ventilation grille on both sides of the bonnet. Dual numbered box. My 2nd version 1954: Large lettering on baseplate and “Made in England” cast on underside rear portion of chassis. No windows. Engraved pattern black tyres. Note the front and rear axle support compared to the 1st type of 1948. 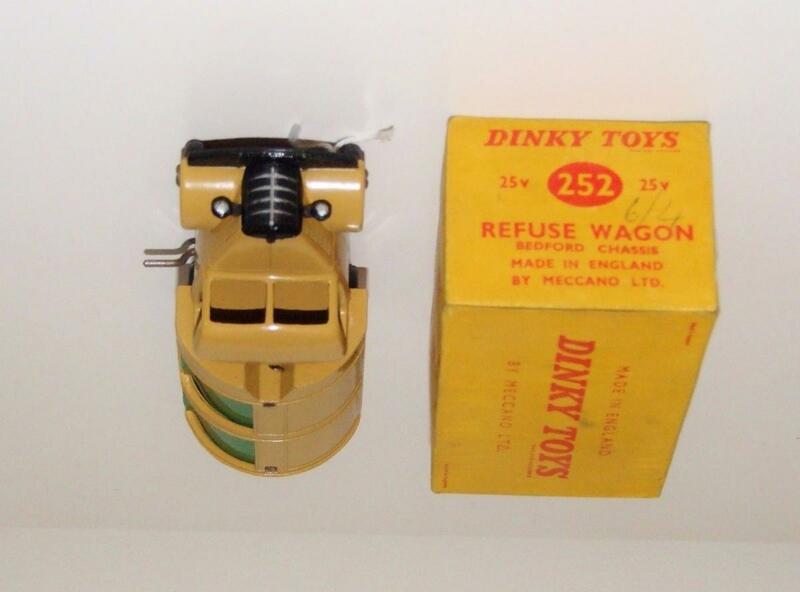 3) My 3rd version Refuse Wagon 252 (without box) ca. 1961: With windows, square corners returned on front mudguards. Smaller air ventilation grille on both sides of the bonnet. Scarcer colour lime green. My 3rd version ca. 1961 - Smooth shiny black baseplate with large lettering and “Made in England” cast on underside rear portion of chassis.. Engraved pattern black tyres. Note the front and rear axle support. There are 5 variants based on the same Bedford chassis/cab casting. These are in chronological order: 25m End Tipper, 521 Articulated Lorry, 25v Refuse Wagon, 25w Truck and 582 Pullmore Car Transporter. 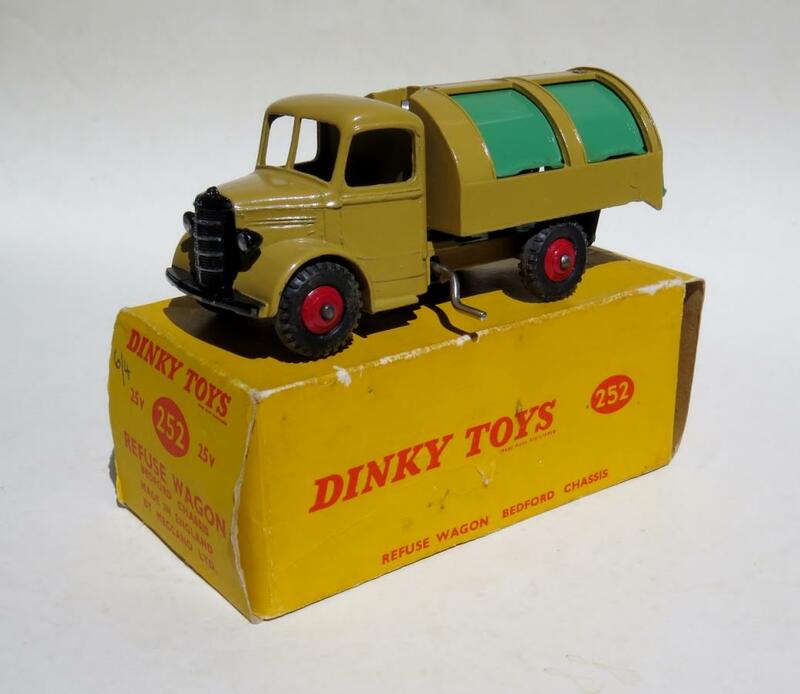 There is no Dinky Toys model that has undergone so many casting variations than the Dinky Bedford. A really challenging model for collectors. When you are interested in pictures of all these casting variations the best you can see in the contributions of Bruce Hoy and me in DTCA topic 521 Bedford Articulated Lorry with the link: http://dtcawebsite.com/forum-topic/521-921-409-bedford-articulated-lorry-1948-1963 . At the end of production of the Refuse Wagon in 1964-65, sales number 252 were fitted with plastic hubs and Radiator/headlight casting and bumper bar were now silver painted. 1964-65: DT 252 Refuse Wagon with plastic hubs and silver painted grille, headlights and bumper bar. 1. Khaki with green metal shutters. 2. Lime green with black metal shutters. 3. Orange/grey with green metal or plastic shutters. I hope you have enjoyed my contribution. Jan, I think you mean my second version with the dual numbered box. The treaded tires would indeed not be expected on this model according your schedule. I can not explain that either. I do not know if possibly models to the USA were an exception in this treaded tires question and possibly examples are known. Of course I can never exclude replacement tires because tires are not a fixed part of a model so replacement is always possible, also in this case. Although you can never date a model with a certain type of tire with 100% certainty, it is quite possible that this model with these properties was issued in 1957-58. I do know that the rounded corners on the front mudguards of this model were issued from mid 1953 and later 1954 "Made in England" was cast on underside rear portion of chassis. This model has also the very late 1953 strengthening on top of fuel tank. But his appearance with treaded tyres and the associated dual numbered box does raise questions and that makes it for all of us only still attractive to think about such questions and to participate in this discussion. So further or additional comments are always very welcome. I am not a specialist with regard to this question. That's why in the meantime I started looking for information about tires to find an answer about this question. I found the answer in the Great Book of Dinky Toys. On page 270 you can find information about wheels and tires. 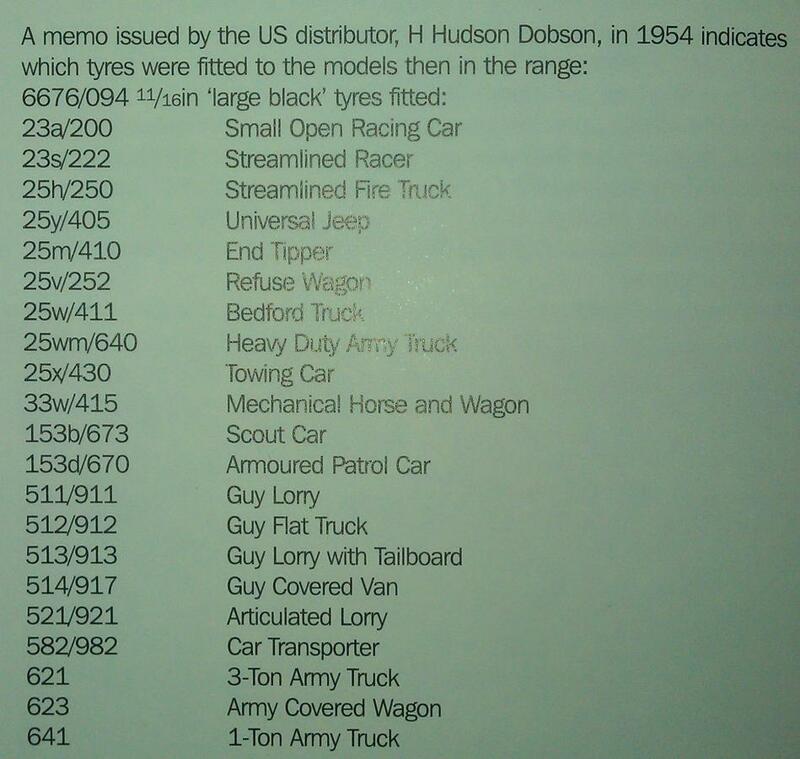 It mentions a memo from the US distributor H Hudson Dobson in 1954 which shows which tires were fitted to the models then in the range. I show this memo which indicates: 6676/094 11/16 in "large black" tires fitted: 25v / 252 Refuse Wagon. My added pictures of the DT catalogue UK 1955 and DT catalogue USA 1958 shows clearly that 6676/094 are black smooth tires, so Jan, you are absolutely right about this smooth tires. The result is that we can conclude that my 2nd model 252-25v regarding the type of tires must be a later model than 1954. 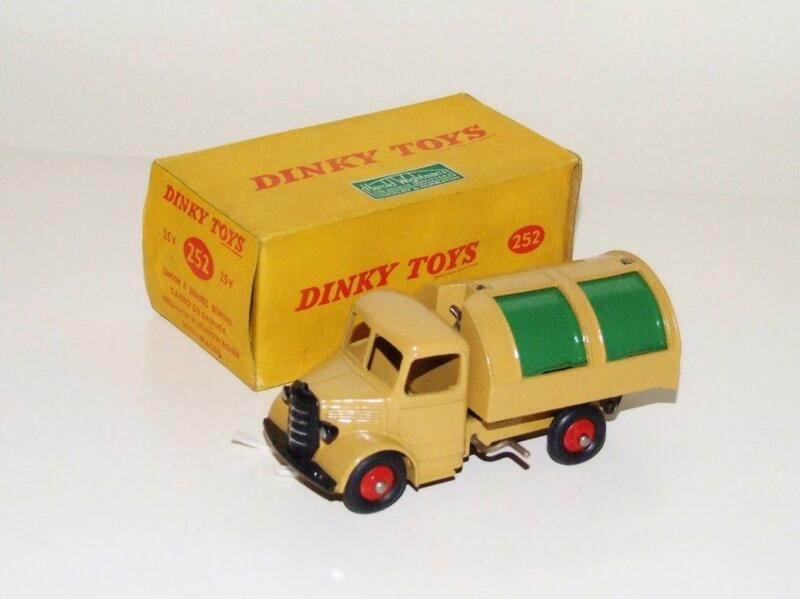 So always something new from Dinky Toys and never too old to learn things. 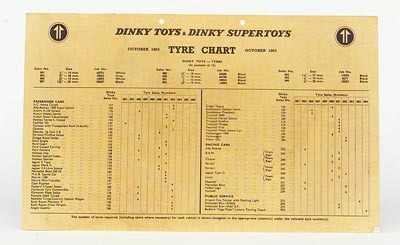 Does anyone have this Dinky Toys & Dinky Supertoys Tire Chart. I found this card on Vectis, but it is too small to read properly. Jan. Thanks very much. I will see who's the first.